The decision to give the PRA a secondary objective to ‘facilitate effective competition’ begs the question as to how policymakers might measure and monitor the intensity of competition in the financial sector. We measure competition by examining the difference between actual industry performance and the outcomes expected under the perfect competition model. The three most common methods of measuring competition (as distinct from concentration) are the Lerner index, the Panzar-Rosse H-statistic and the Boone indicator. Each measure focusses on different characteristics of firms’ interactions, providing researchers with different viewpoints on competition and, where outcomes are similar, lending greater confidence to the results. Liu, Molyneux and Wilson (2013) discuss a wider range of methods than included here, including the limits to using concentration measures and the properties of indicators used to measure competition. The Lerner index measures the price-cost margin and is relatively straightforward to interpret. Under perfect competition output prices equal marginal costs, while prices move increasingly above marginal cost as market power increases. Practically, the Lerner index is the difference between the output price and marginal cost divided by the output price, so the index lies between zero (perfect competition) and one (strong market power). 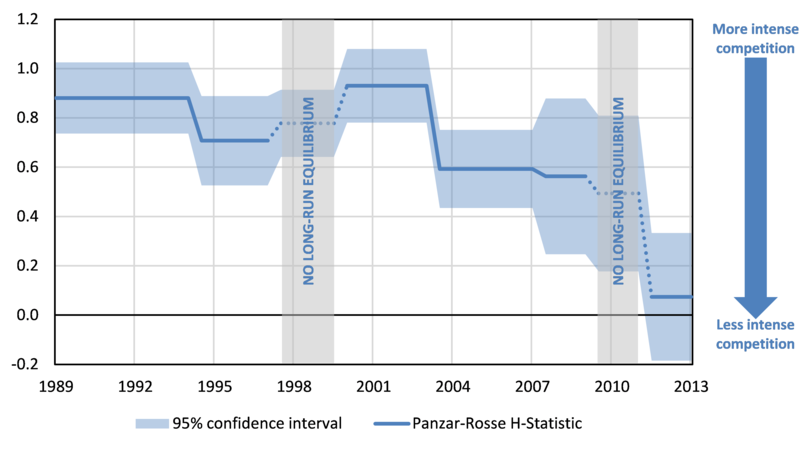 The Panzar-Rosse H-statistic measures the influence of input prices on revenues. Under perfect competition, firms earn zero economic profits. If input prices increase, firms’ revenues must increase proportionately, once the industry has fully adjusted, to restore zero profits. The H-statistic is, in effect, the long-term elasticity of firms’ revenues to input prices and is one under perfect competition (i.e. input costs are fully passed through to revenues) and moves towards zero as competition declines. The H-statistic requires competition to be in long-term equilibrium to be valid (for which there is a test), so estimates are generated over a longer time frame (say 3-5 years) rather than at a point in time. The Boone indicator is relatively new and relies on the ‘output reallocation effect’: more efficient firms can expand output at lower cost than less efficient firms as competition increases. In practice, the Boone indicator is a measure of the elasticity of profits to average variable costs. Where competition is less intense, inefficient firms with higher average variable costs survive and average profits across the sector are less sensitive to costs (the elasticity moves towards zero). Unlike the H-statistic, the Boone Indicator does not need a long-term equilibrium to be valid and can be estimated at each point in time. To estimate each of these competition measures, we use a newly developed regulatory dataset at the Bank of England that includes all UK-regulated deposit takers for the period 1989 to 2013 (the details of the data are set out in a forthcoming Bank of England Staff Working Paper by de‑Ramon, Francis and Milonas). 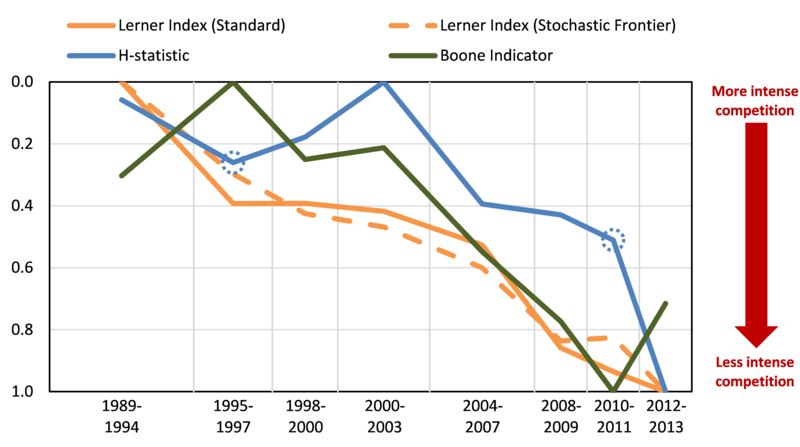 First, we look at the Lerner index for which we have two estimates: one using a standard approach from the literature as discussed in Berger, Klapper and Turk-Ariss (2009) (Chart 1a) and the other an innovative, stochastic frontier technique proposed by Kumbhakar, Baardsen and Lien (2012) and applied by Coccorese (2014) ((Chart 1b). Both charts show that the price-cost margin widened generally over the period (we’ve inverted the scale such that downward movements show wider margins), suggesting that competition moved from more to less intense. One trend to highlight is that margins were rising in the years ahead of the financial crisis (from 2001 to 2007 for both measures). Margins then moved higher again following the crisis. Our estimates of the Panzar-Rosse H-statistic follow the methodology set out in Bikker, Shaffer and Spierdijk (2013) and are shown in Chart 2. These estimates move in discrete steps and show two periods during which there was no long-run equilibrium (determined by the aforementioned test) where the estimates are unreliable. The H-statistic shows that competition strong over most of the 1990s. However, like the Lerner index, there is a significant deterioration in the intensity of competition in the sector, from the period 1999-03 to 2004-07, ahead of the financial crisis (values closer to zero indicate less intense competition for this measure). After 2007, competition continues to deteriorate. Finally, we turn to the Boone indicator as developed by Boone (2008) and Boone, van Ours and van der Wiel (2007). 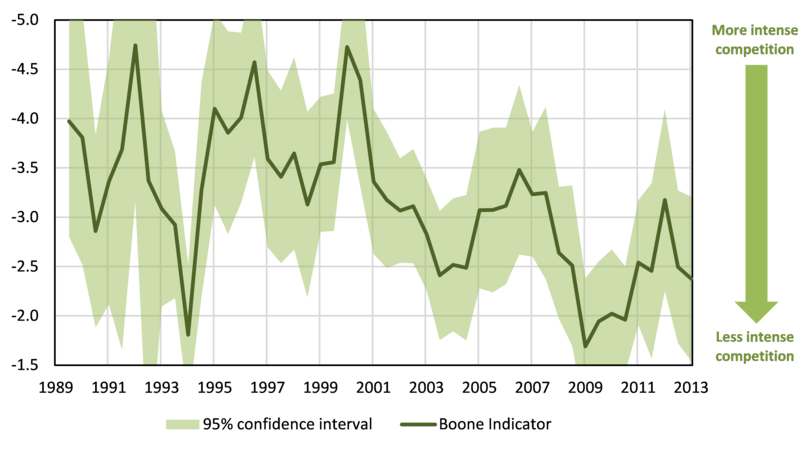 The Boone indicator is more volatile than other measures, but again shows a move from more to less intense competition from 1995 to the end of the period, after an initial volatile period in the early 1990s. If we focus again on the period ahead of the financial crisis, while there is some drift towards more intense competition in the two to three years immediately ahead of the crisis, there is a distinct shift from a more intense competitive environment to a less competitive environment on average from the second half of the 1990s to the period from 2002 to 2008. More recently, from around 2010, the indicator shows some improvement in competition. Why does competition look the way it does? Chart 4 below shows all our measures plotted together on the same scale so that downward movement indicates decreasing competition. We’ve used the periods defined for the H-statistic to ensure valid comparisons between measures (the H-statistic is the only measure that is not valid for some periods). So what might be driving the common trends observed across the range of estimates? To set the scene, financial market reforms of the 1980s (e.g. the removal of the bank “corset” and the “Big Bang” reforms) radically changed the regulatory landscape allowing banks and building societies to offer a wider range of products and compete more directly with each other. Our measures show strong competition in the 1990s / early 2000s as firms adapted to the new landscape (as indicated by all measures). New technology meant credit decisions were centralised, allowing branches to become sales points for the greater scope of products now on offer. Banks consolidated, and building societies demutualised to compete more directly with banks. A number of large banking groups emerged from this process, encouraged by the desire to compete effectively with large foreign banks (Centre for Policy Studies (2006)) and from a desire to promote financial stability (Sinclair (2000)). That’s not to say that consolidation did not raise concerns – the Cruikshank Review of Banking Services in the UK (2000) noted a lack of competition emerging in several markets. In 2001, consolidation ended with the last big pre-crisis merger (the creation of HBOS). The trend in competition intensity changes from that point onwards, weakening noticeably across all measures from 2000-03 to 2004-07. Our results suggest that during this period firms earned increasing market rents up until the 2008 financial crisis. In the post-crisis period (2010-13) the picture is less clear. Some measures show ongoing weakening of competition (standard Lerner index, H-statistic), competition intensity holding up before weakening (stochastic frontier Lerner index) and competition improving in 2010-11 (Boone indicator). These differences may reflect the various direct interventions in markets undertaken in response to the financial crisis (e.g. Bank Recapitalisation Fund, Special Liquidity Scheme, government loan guarantees) which drive outcomes away from purely market driven outcomes. 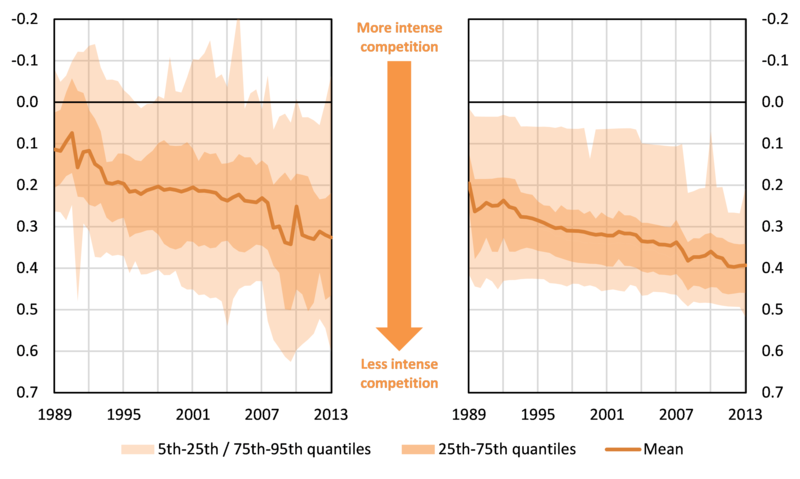 Overall, the measures of competition we estimated show that competition intensity between deposit takers was generally good in the 1990s as firms adapted to the deregulated environment, but weakened in the years immediately ahead of the financial crisis. This outcome is not consistent with the hypothesis that financial stability is enhanced by less competition, and suggests that the relationship between competition in the deposit-taking sector and systemic financial stability is not straightforward. The measures of competition that we have can now be used to gain a better understanding of how competition interacts with financial stability. Watch this space. Michael Straughan and Sebastian de-Ramon work in the Bank’s Competition and Impact Assessment team in the Prudential Policy Directorate. Previous Post Low for long: what does this mean for defined-benefit pensions in the UK?